When I first heard about this book, I wondered whether there was a need for another book about keeping chickens, but when I learned that Jeremy Hobson was the author, I was keen to obtain a copy. Jeremy Hobson is highly regarded and his name already peppers my book shelf as the author of a number of excellent books on poultry and smallholding (he has almost 30 titles published now) so I was keen to get stuck into his latest offering. Jeremy Hobson is certainly no newcomer to the world of poultry, having kept chickens for over 40 years and this is evident in his writing. 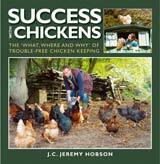 Jeremy offers very practical advice to chicken keepers and Success with Chickens is both an enjoyable read and useful reference book for newcomers to the hobby. The more experienced poultry keeper will also learn something new though and I certainly gleaned some interesting facts that I hadn’t read elsewhere. Some of the subjects covered in the book are what to keep: the choice of chickens, where to keep chickens: housing, runs and legalities, why keep chickens: for children, in gardens, and even in schools, in fact every subject that a new chicken keeper would want to know. There are other chapters on health, breeding, incubation and rearing chickens and some good information on getting started with showing chickens, something that is rarely found in most chicken keeping books in any detail. Also included, either because of their relevance, or simply their ability to raise a wry smile, are several snippets taken from poultry books written during the first half of the twentieth century. I particularly liked one of the final chapters that is called “Fowl Facts and Fancies” which as Jeremy says he gathers “some bits and pieces which, while they may not help you to have any more success with chickens, will, add to your knowledge and enjoyment of them”. He presents some rather interesting and amusing facts and figures and there are photos of the largest, smallest and tallest chickens and a number of other odd-looking breeds of chicken such as the Frizzle and Transylvanian Naked Neck amongst others. Whilst talking about photographs, it is certainly worth mentioning that most of the excellent colour photographs in the book have been supplied by the talented poultry photographer Rupert Stephenson who has managed to capture the right images for nearly every topic in the book which makes it a real pleasure to read. The book retails at RRP £14.99 although a quick browse on Amazon shows it can be found far cheaper than this at the moment and I see there is a Kindle version as well. If you’re looking for a good all round book on chicken keeping, Success with Chickens should definitely be on your short list!